Volunteers offered a hand during the 27th Annual Day of Caring. More than 1,100 volunteers picked up paintbrushes, shovels and whatever other tools they needed to improve and beautify the community Sept. 15 during United Way of Santa Barbara County’s (UWSBC) 27th Annual Day of Caring. Teams and individual volunteers spread out to 53 community projects, including clean-up at several Montecito properties damaged during the January mudslides, organized in partnership with Habitat for Humanity of Southern Santa Barbara County. From completing much needed vegetation work at the Santa Barbara Rescue Mission’s Bethel House to sprucing up around the Santa Barbara Zoo, volunteers completed an estimated $300,000 in donated labor. Volunteers worked from 9 to noon and finished up at a Thank-You BBQ at Oak Park, generously sponsored by Alberstons/Vons. 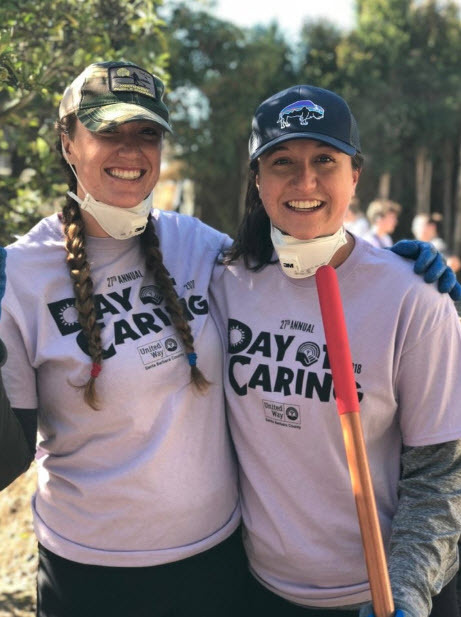 Day of Caring is part of a nationwide effort to support community organizations by connecting thousands of volunteers with beautification and improvement projects that otherwise might not be completed. Thank you to this year’s sponsors: Albertsons/Vons, Cottage Health, Costco, Cox, Exxon Mobil, Karl Storz, La Arcada, Lockheed Martin, Montecito Bank & Trust, Pacific Coast Business Times, ParentClick.com, Procore, Santa Barbara Independent, Santa Barbara News-Press, Stonefire Grill Ventura, The Towbes Group, and Union Bank.